RIGHT LIGHT – Plan ahead to get your best lighting? Be clear about your mission. What do you want from the lighting showroom? Design help? Fixture selection? Call ahead, and set up a time. If you have an appointment, a lighting expert can be ready to give you full attention and provide more beneficial service. Ask about consulting costs. Most salespeople will give a complimentary half hour to provide lighting tips, but beyond that, they may charge a good faith retainer. Go early in the project. Consulting with a professional early in your project will help you avoid making design decisions that result in costly and time consuming changes to previously completed steps. Know that lighting educators want to be your partner. Lighting professionals want to create a partnership with their customers. Refreshed metal elements can add unusual textures and intricate cut-outs to new fixtures. 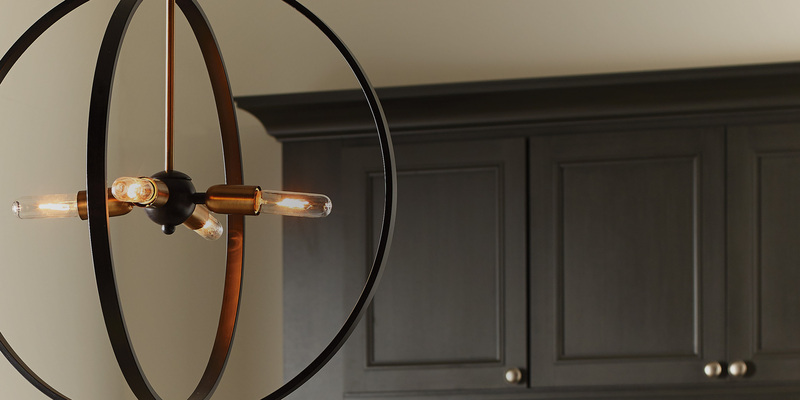 One carefully chosen statement fixture can be all that is needed to create a perfectly designed space. Kichler’s Albellona chandelier (pictured at right) features elegant sweeping arms in a sterling gold finish highlighted with delecate crystal beading for a statement-making designer touch. EXPERT ADVICE – Want More Ideas? Ask a Lighting Professional. We want to add toe-kick lighting below our cabinets and accent lighting above our cabinets. What type of lighting would work best? – Paula and Marcia A.